Half Square for 40m with 10ft base height, very good ground. 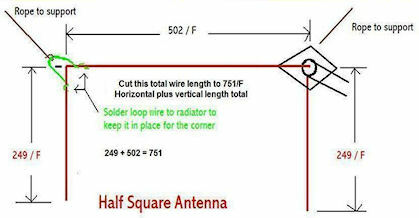 A Simple 40-Meter Half Square Antenna. Several hams have used this simple antenna to increase their contacts on 40 meter. The antenna provides some gain over a single vertical antenna and offers some signal rejection off the sides. The half square is a wire antenna with 2 vertical elements fed in phase. One quarter-wave vertical is fed at a top corner where its attached by a coaxial center connector (such as the Budwig HQ-1). The other end of the coaxial connector is attached to a horizontal half-wave phasing line and then connected to another quarter-wave vertical aiming down to the ground. Both vertical segments are insulated from ground. The vertical elements are supported by masts or other objects such as trees. With the antenna being fed at a top corner, the current portion of the antenna is high with a good match to 50-ohm coaxial cable. No ground radial system is required. According to some antenna experts, the half square is essentially broadsided, bidirectional, and exhibits between 4 to 5 dB of gain over a single vertical radiator. Perfect for DX activity.